Priority for the discovery of the elements with atomic numbers 114 and 116 has been assigned, in accordance with the agreed criteria, to collaborative work between scientists from the Joint Institute for Nuclear Research in Dubna, Russia, and from Lawrence Livermore, California, USA (the Dubna-Livermore collaborations). The discovery evidence was recently reviewed and recognized by an IUPAC/IUPAP Joint Working Party. IUPAC confirmed the recognition of the elements in a letter to the leaders of the collaboration. 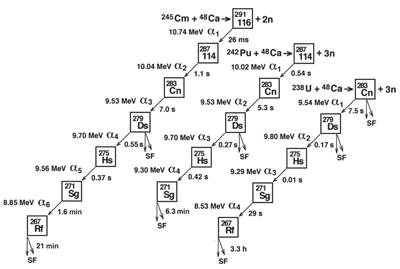 A summary of α-particle decay chains observed by Dubna and collaborations illustrating the matched characteristics of 283Cn attained through three otherwise independent entrance bombardment plus α-decay combinations. The IUPAC/IUPAP Joint Working Party (JWP) on the priority of claims to the discovery of new elements has reviewed the relevant literature pertaining to several claims. In accordance with the criteria for the discovery of elements previously established by the 1992 IUPAC/IUPAP Transfermium Working Group, and reiterated by the 1999 and 2003 IUPAC/IUPAP JWPs, it was concluded that “the establishment of the identity of the isotope 283Cn by a large number of decaying chains, originating from a variety of production pathways essentially triangulating its A,Z character enables that nuclide’s use in unequivocally recognizing higher-Z isotopes that are observed to decay through it.” From the 2004 Dubna-Livermore collaborations, the JWP notes: (i) the internal redundancy and extended decay chain sequence for identification of Z = 287114 from 48Ca + 242Pu fusion (Oganessian et al. Eur. Phys. J. A 19, 3 (2004) and Phys. Rev. C 70, 064609 (2004)); and (ii) that the report of the production of 291116 from the fusion of 48Ca with 245Cm is supported by extended decay chains that include, again, 283Cn and descendants (Oganessian et al. Phys. Rev. C 69, 054607 (2004)). It recommends that the Dubna-Livermore collaborations be credited with discovery of these two new elements. A synopsis of the relevant experiments and related efforts is presented in a technical report published online in Pure and Applied Chemistry on 1 June 2011. With the priority for the discovery established, the scientists from the Dubna-Livermore collaborations are invited to propose a name for the two super-heavy elements: 114 and 116. The suggested names will then go through a review process before adoption by the IUPAC Council. Reviews of the claims associated with elements 113, 115, and 118 are at this time not conclusive and evidence has not been met for the discovery criteria. Page last modified 8 July 2011.